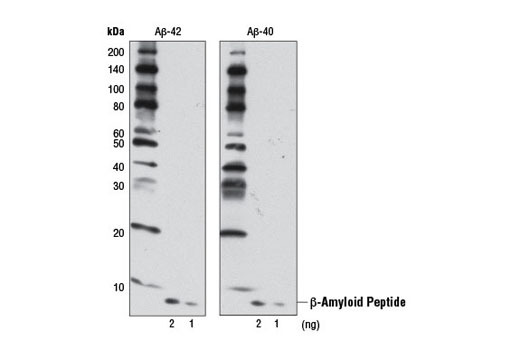 Western blot analysis of the indicated amounts of human Aβ-42 (left) and Aβ-40 (right) peptides using β-Amyloid (D12B2) Rabbit mAb. Western blot analysis of human Aβ-37, Aβ-40, and Aβ-42 using β-Amyloid (D12B2) Rabbit mAb. 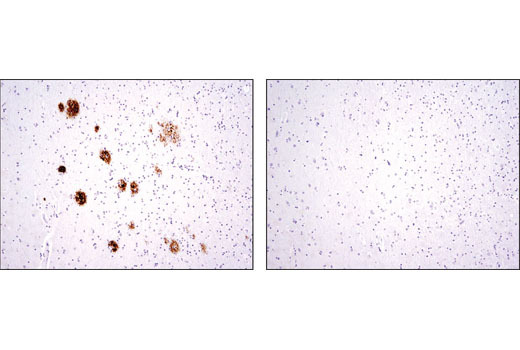 Immunohistochemical analysis of paraffin-embedded human Alzheimer's brain using β-Amyloid (D12B2) Rabbit mAb in the presence of control peptide (left) or antigen-specific peptide (right). 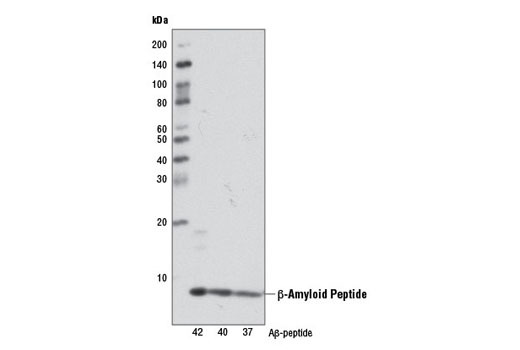 β-Amyloid (D12B2) Rabbit mAb recognizes endogenous levels of total β-amyloid (Aβ) peptide. The antibody detects several isoforms of Aβ, such as Aβ-37, Aβ-38, Aβ-39, Aβ-40, and Aβ-42. This product detects transgenically expressed human APP in mouse models. Monoclonal antibody is produced by immunizing animals with a synthetic peptide corresponding to residues near the amino terminus of human Aβ peptide.